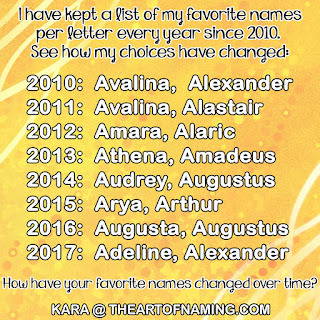 Today I'm featuring my favorite boy name that I took from my upcoming World-Wide Wednesday post that features names from Australia! This name is also used in other English-speaking nations but it is extremely rare in the US! The name is Rafferty. I can't help but love it. I think it is adorable, and yet, it really doesn't have your typical "American" feel. I love that Australians like it though! Over there, it is ranked at #292 with a total of 17 births for the year in Victoria. It is actually an Irish surname that originates from Ó Raifeartaigh which came from O’Raithbheartaigh. It means "Abundance" or "Prosperity Wielder". It is still very much used as a surname today. Thanks to the rough sound of Rafferty, it works better on a boy than on a girl as a first name. Some surnames could go either way, but this one has a boyish vibe to it. In fact, the term "Raffish" means "unconventional and slightly disreputable, especially in an attractive manner." It makes me think of a badboy with shades and motorcycle that all the girls are crazy about; or a rough-and-tumble toddler playing in the mud. It has a certain charm to it as well. 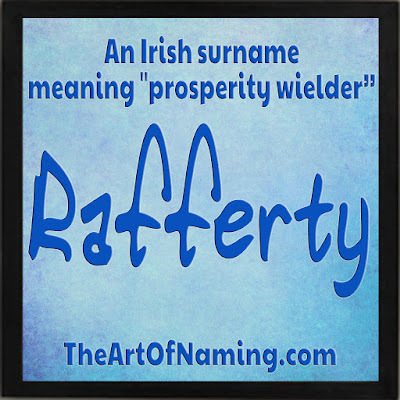 However, despite the meaning of raffish and the fact that it might make you think of riff raff, Rafferty does have a great meaning. I would say it is rather upbeat and edgy, a cool option for a boy. However, most of America has not fallen in love with this name yet. Jude Law's son was born in 1996 which gives this name a bit of star power. The name first appeared on records in 1989, 1990 and 1992. Not again until 1998 and then 2002, all with 5 births per year. By 2004, the name gained some regular usage. There was a record-high of 13 births in 2005, 2006 and 2008. AS of 2016, there were only 10 boys given the name Rafferty in the US, so if you happen to know one, he's very unique! There were 2 born in Scotland in 2012, ranking it at #1106. There were 106 born in England and Wales in 2011, ranking it at #378; and in 2016, there were 181 male births for a rank of #280. In Australia, I already mentioned that the name is ranked at #292 but I'm told by Australian Baby-Name Expert, Anna Otto, that names starting with Raf- are "currently quite big" in Australia. Rafferty in particular honors iconic Australian screen legend “Chips” Rafferty. 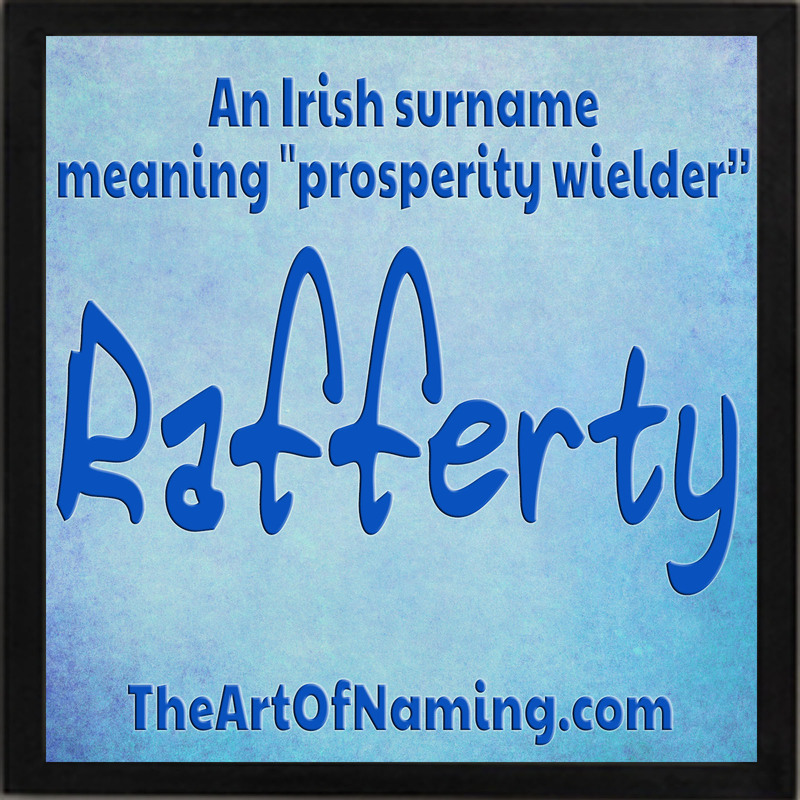 Because of his fame, the name Rafferty has become a favorite celebrity baby name. I think something short and sweet would be great in the middle name spot, especially if it also has an Irish background. 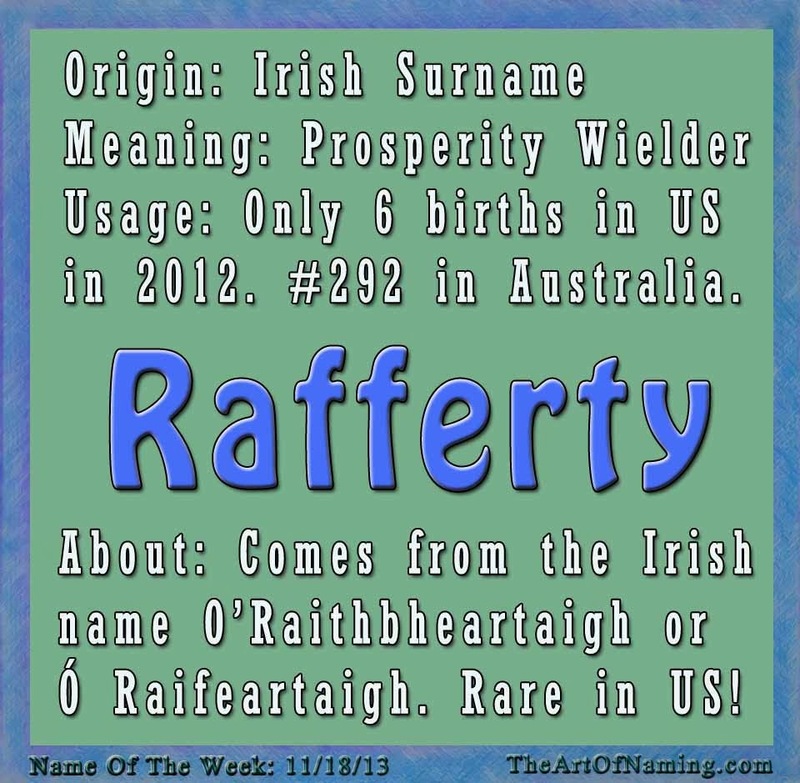 Raff or Rafe are both great nicknames, or even RJ if you used a J middle name! What would you pair it with? What do you think of it? Let me know! What would YOU pair with Rafferty? Rafferty has another association in Australia - "Rafferty's rules" is slang for no rules at all! So the name definitely has a bit of a knockabout, lawless feel to it. 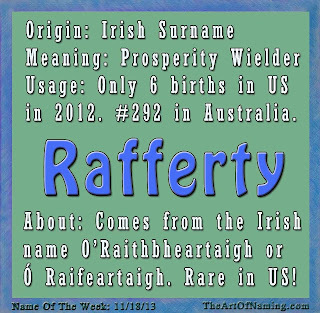 I love Rafferty with nickname Rafe. The long form is the right blend of friendly but formal without sounding too stuffy, while Rafe feels like a cheeky, fun guy. I'm Australian, but surprised it isn't becoming more popular in the UK and US too.